Achieve performance excellence in the only all-Disney-produced competitive music festival. When you own the Disney stage, you own the world. Join Festival Disney and give your talented ensemble the chance to compete with instrumental, choral and auxiliary groups from schools across the country. Only middle, junior high and senior high groups may participate in Festival Disney. Festival Disney takes place on Fridays and Saturdays (and selected Thursdays) at the Walt Disney World� Resort in Florida. Your performance at one of our "world class" performance venues such as the Premiere Theater at Disney's Hollywood Studios� or Disney's Saratoga Springs Resort just to name a few, culminating with a grand Festival Disney Awards Ceremony. Complete the attached application and submit it with festival entry fee. Select a package from below or to customize your own call a Travel Planner. PLEASE NOTE: Group packages and pricing are based on a minimum of ten rooms sleeping 4-to-a-room. Attendance for All events is limited. Requests will be processed on a first-come, first-served basis. There is NO guarantee your group will be able to attend Festival Disney. Confirmation will be sent to you upon acceptance. 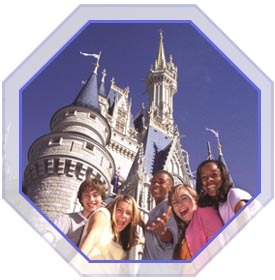 1st Stop Group Travel Planners, Inc. will be your travel planner and contact for Festival Disney. Reserve your group space today!